In this post I’ll show you how to change content of PowerPoint presentations by using Alteryx. You can change text, graphs, pictures in your own template. Automate your standard presentations to eliminate potential errors and save time on time repetetive tasks. In order to identify what elements to change in your PowerPoint using Alteryx, you have to add some unique variables you want to replace using new data from Alteryx. It could be a header like Company_Name (see below example with template and output). Or other data like numbers, pictures, graphs etc. 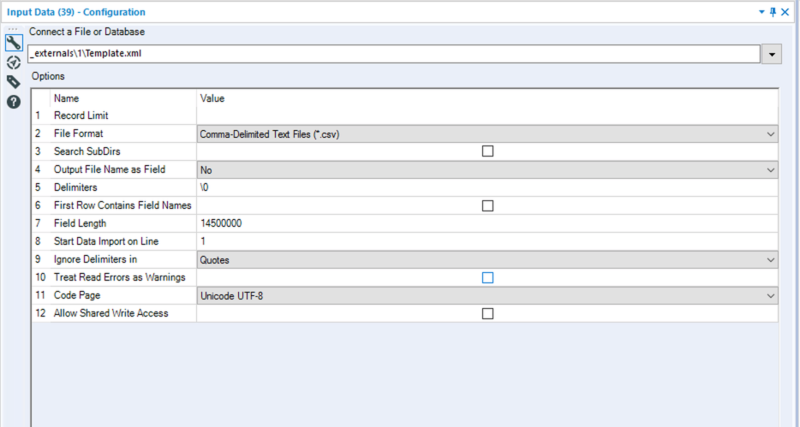 First Row Contains Field Names: "uncheck"
Now concatenate the XML into one field using the Summarize-tool. At this stage your Workflow is fairly static, but by changing the replace element of your "Find Replace"-tool to reflect what the user selects in e.g. a dropdown you can start building PowerPoints with content based on the users input. Based on inputs from the user e.g. like "company name" you would be able to build a report using relevant pictures, downloading information from company-specific pages like CVR, query data from databases and changing numbers in prebuild graphs in PowerPoint, and more. The power of the Alteryx Server would at this point be to enable an organization to build automatically created PowerPoints using a shared app freeing up time from building PowerPoint to actually create value for the company. Credit to Helle from Danica Pension for sharing the idea of using Alteryx to edit PowerPoint XML.